Jaime has done some great research on how people search (including her fantastic papers about how often people redo searches for things they've previously searched for). We've worked together a bit on a couple of things--most notably teaching a "logs analysis" tutorial at the Computer-Human Interaction (CHI) conference and then turning this into a book chapter (forthcoming). If you read this blog, I suspect you'll enjoy hers as well! Search on... for more great search/research blogs! 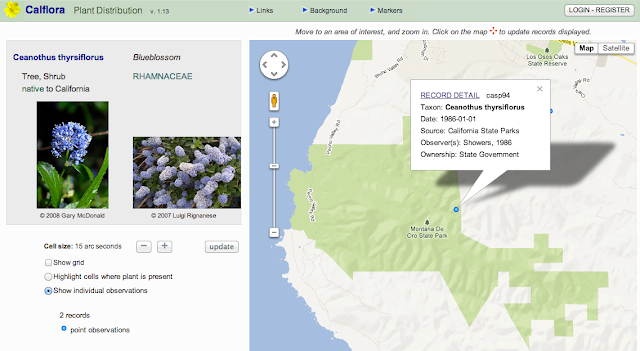 Answer: Where can I find a blueblossom in Montaña De Oro? This was a legitimately tough problem. It’s not hard to KNOW that blueblossoms grow in Montaña De Oro, but it’s very difficult to know how to locate a specific one somewhere in the park. 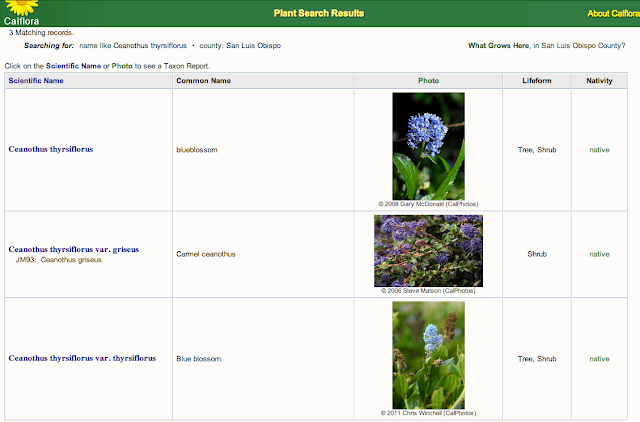 In this case, after searching for a while for maps of Montaña De Oro with plant locations indicated (I was hoping for a trail map with a trailer marker than said “blueblossom here” or something something thyrsiflorus. But after 20 minutes of looking, I wasn’t finding much. A few pictures here and there in Panoramio, but nothing with a good location marker. When you can’t solve the problem directly with search, search for a tool that can do it for you! What would such a tool be like? I stepped back for a second to think about this. What kind of person or organization would be interested in tracking the location of flowers, their habitat and where the grow? As you can see, the first and third results seem linked to the Santa Monica Mountains in southern California. I know that Montaña De Oro State Park is really in central California along the coast, and nowhere near Santa Monica (which is in LA). 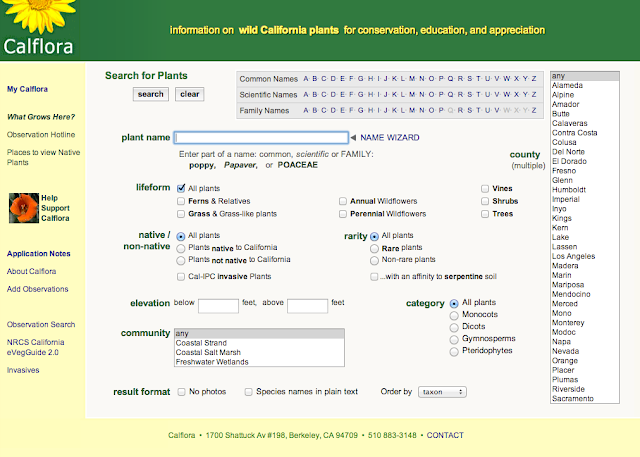 I checked out the CalFlora site (number 2 in the above list). I clicked on the entry in the first row, and found this page. Now… Note the “Distribution Grid” link in the center of the page. This is fantastic! Now, I just zoom in to our State Park location on the Central California coast, and click on "Show individual observations." That places this individual shrub of our desired flower on the banks of the Islay Creek, just inside the eastern boundary of Montaña De Oro State Park. So you can see what we’ve done… Mission accomplished. Found the plant and the location. 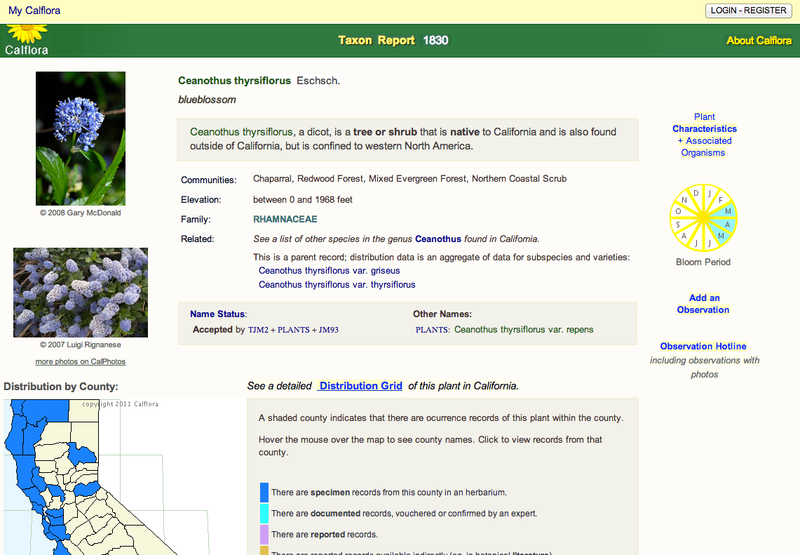 (1) When searching for a particular plant (or flower, or anything, really), be sure you know all the ways it can be named. “Blueblossom” is really a fairly generic term. It’s also a common name for a common plant. 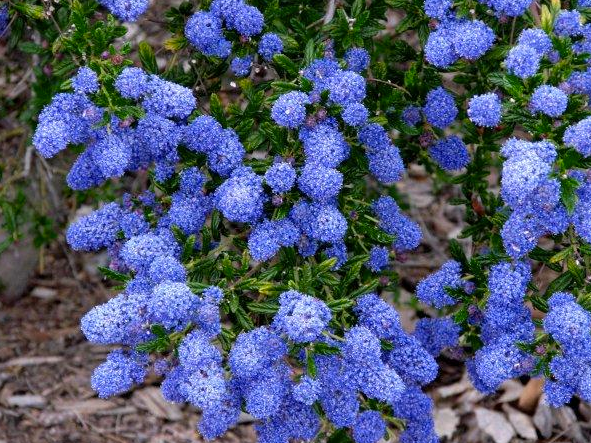 But the Latin binomial name (Ceanothus thyrsiflorus) really is unique. 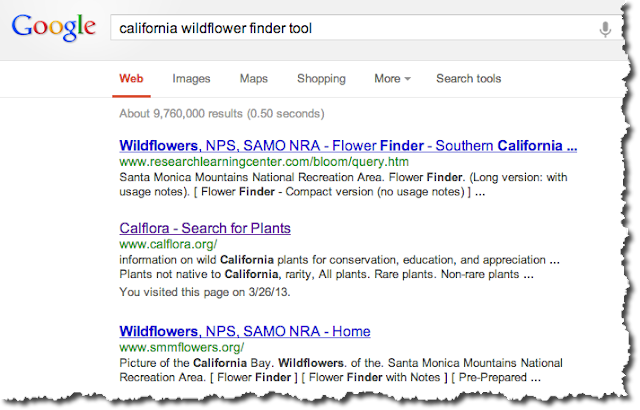 Be aware that searches can show the result in many different names. 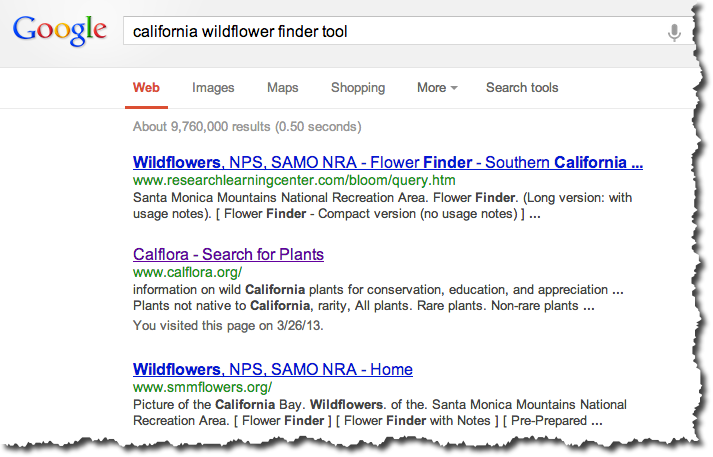 (2) When you’re not having much luck using regular web search (and in particular when the results just aren’t showing much of anything), think about searching for a tool that can do the same thing. In this example, we found the CalFlora geographic distribution search tool, which fit our need precisely. 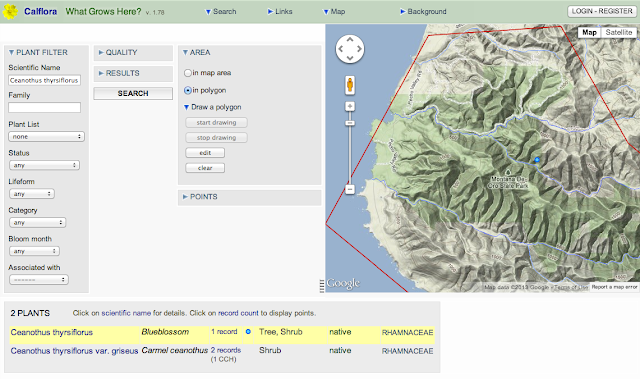 If you fill out the location, you can then jump to an interface that lets you draw a polygon. (In this case, I drew one to outline the State Park.) 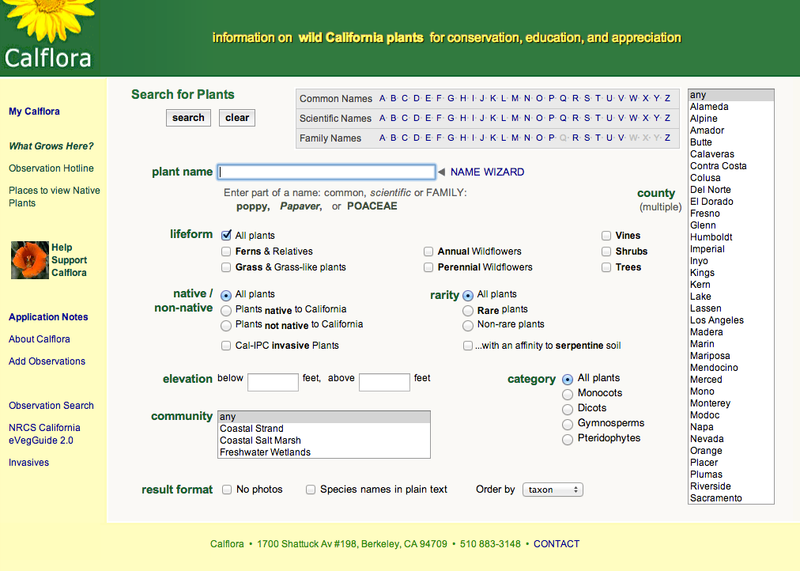 Then selected the Scientific Name and hit search. 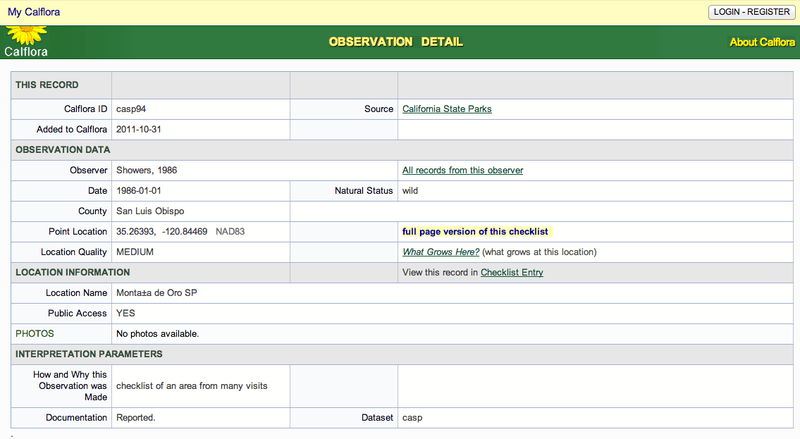 The beautiful thing about this web page is that you can filter on all KINDS of metadata--status (endangered, etc. ); the month it blooms; whether it's a monocot or dicot (yes.. really!). A marvelous resource! And I'm still exploring it. Highly recommended. Wednesday search challenge (3/27/13): Where can I find a blueblossom in Montaña De Oro? One of the joys of living in Silicon Valley is the closeness of nature. Yes, I live and work in an urban setting, surrounded by tilt-up buildings, swarmed by software engineers, venture capitalists, and startups. But nearby—very nearby—one can disappear into the hills and trails of the Santa Cruz mountains. You also don’t need to travel very far to see some truly spectacular scenery. I’m especially fond of a flowering bush that’s called “blueblossom.” It’s also called the “California lilac” because it looks a little like a regular lilac (which is in the family Syringa) and smells a LOT like a lilac. The scent is positively heady when you walk through large stands of the blueblossom. Not far from Mountain View is a state park known as Montaña De Oro. It’s near the college town of San Luis Obispo on the central California coast. It’s absolutely one of my favorite places to visit (both the town and the state park). 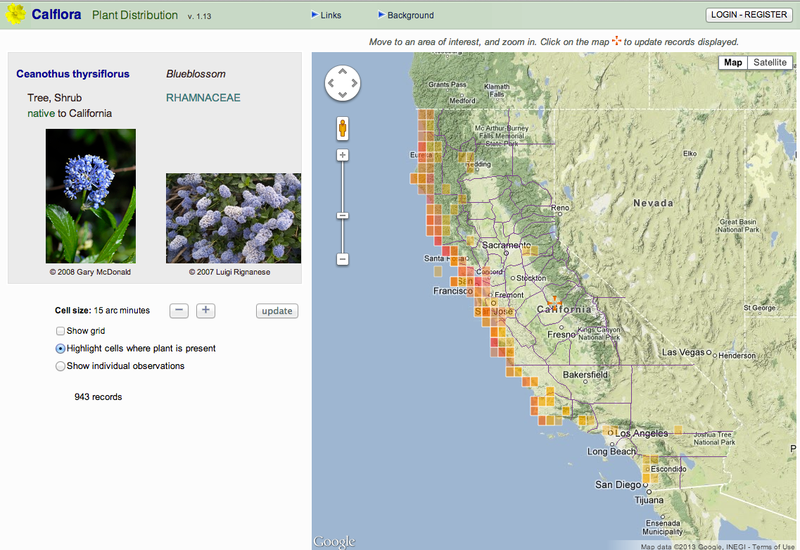 Where can I find blueblossoms blossoming in Montaña De Oro State Park? As always, please write your proposed answer in the comments field below, noting HOW you found the answer AND how long it took you to figure it out. The blue arrow is the location of the Tunnel Rock quarry; the red arrow is the reported location of the Kaiser Sand & Gravel quarry. The pink camera icon is where I actually took the photo. First off, let me congratulate the searchers! Ramón, Rosemary, Maca… you’re doing great work! Like Hans, I also wrote to Steve Edwards—he also told me that he wasn’t really a historian. A great guy, but he didn’t really know when the quarries operated. This makes it sound as though Tunnel Rock opened around 1951 and the Kaiser Sand & Gravel pit opened in January 1954. The text (which I read carefully several times through) makes it implicit that the Kaiser quarry opened then. And I still haven’t made it over to Stanford library to check out that book by Steve Edwards. But if his email is any indication, I bet there’s not much in it to answer our questions. Search lessons: First off, the willingness to stick-with-it and learn from other people's searches... that's a key lesson. The idea to search at Consrv.ca.gov was a great idea. Answer: What came from the mine? Sorry about taking an extra day to give you the answer. These days are busy, and sometimes things get slightly out of hand. Recall that the questions were (1) When did the mine open? 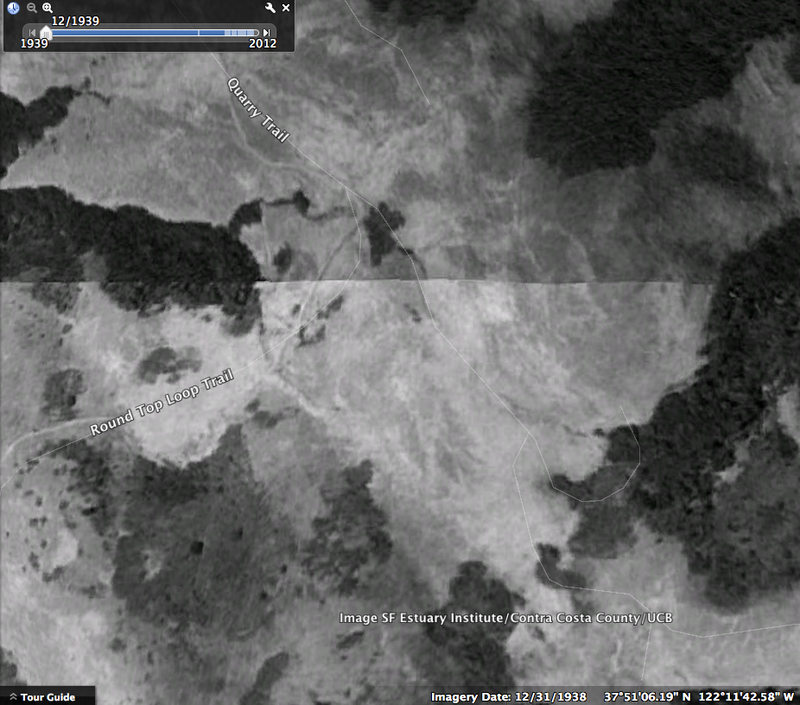 And, (2) What was mined here? First, you have to realize that the GPS data wasn’t quite right. Once you’ve extracted the lat/long from the EXIF data, you’ll quickly see that there’s no labyrinth exactly at that location. The quarry hole and labyrinth are actually at: 37.853058, -122.190440 (I assume you figured that out and just panned around the location in Maps for a minute before finding the actual location). By looking at the map I could easily tell that this location is part of the Sibley Volcanic Regional Preserve, which is a beautiful open-space preserve run by East Bay Regional Park District. 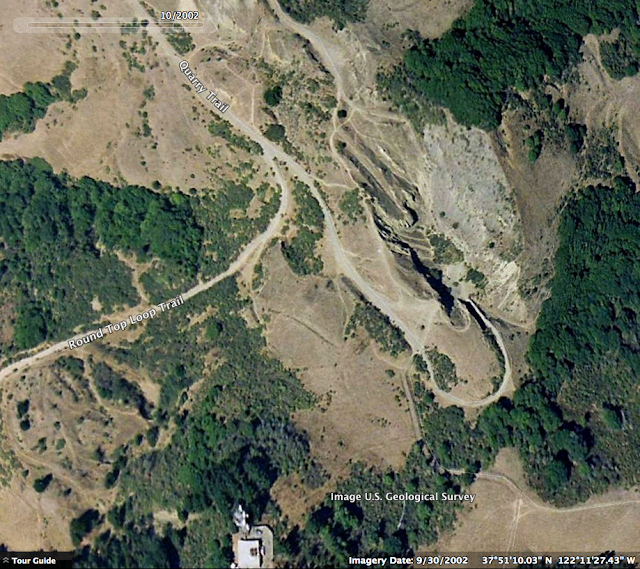 Now we have our first clue: The quarry was the “Kaiser Sand and Gravel” company. 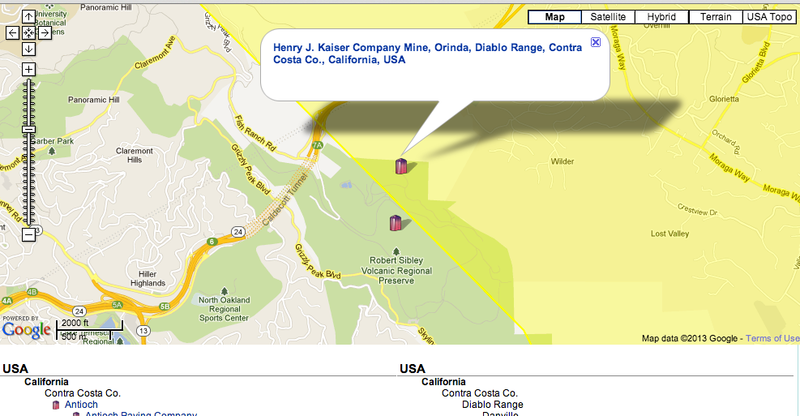 A quick look at the map, however, tells me there are TWO mines/quarries in that immediate vincinity. 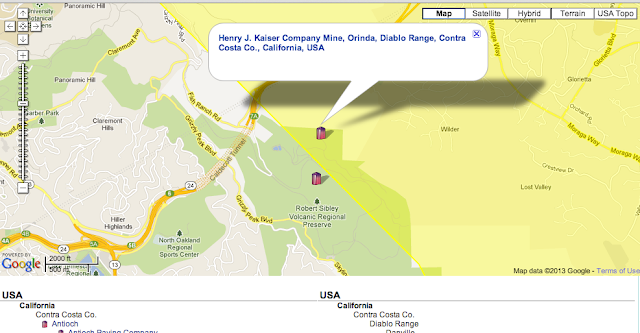 The “Henry J Kaiser Company Mine” (aka “Kaiser Sand and Gravel) AND the “Tunnel Rock” mine. Let's check out these alternate lead. show a few additional results. (Since there are SO many Kaiser mines, I had to add in “gravel” to limit my search to something managable). (a variant phrase I picked up from reading), I find another resource http://www.mindat.org/loc-76633.html that gives me the lat/long for this mine: 37°51'36", -122°12'1"
Continuing my search, I find another good hit at http://minerals.livescience.com/l/28961/Henry-J-Kaiser-Company that repeats what we saw earlier—that the quarry was used for broken rock, sand, and gravel. 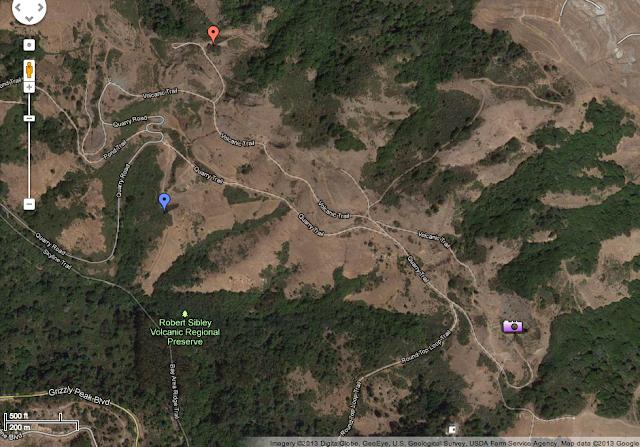 Here’s my Google Maps version of the two mines. The Kaiser mine is the red arrow, and the Tunnel Rock mine is in blue. So now… when did they open? Like other readers, I’ve only been able to find a few clues here and there. I found a couple of hiking guide books that claim the mines were opened in the 1930s… but they don’t say where THEY found that information, so I’m worried that the reliability might not be very high. And when I look at this location with Google Earth (using the Time Slider), I see the following images—from 1939, 1993, and 2002. So… I’m a little stuck here. I think we’ll have to find an additional source of information. Were these mines REALLY active between sometime between 1993 and 2002? 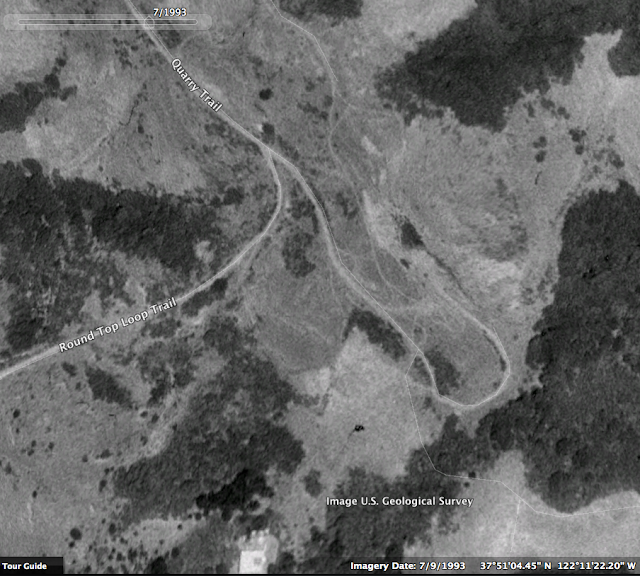 OR… is the Google Earth image for 1993 just mislabeled?? More research is required! Ideally, we'd like to find a different aerial archive image with dates in the 1930s and '40s; or maybe someone's first-person account of mining in this area. Answer: How much death at the roadside? Answer: Who started the library?